Bebop is characterized by its focus on improvisation. Borrowing from swing, and rooted in the blues, bebop is the foundation on which modern jazz was built. These ten musicians are partly responsible for bebop's creation and development. 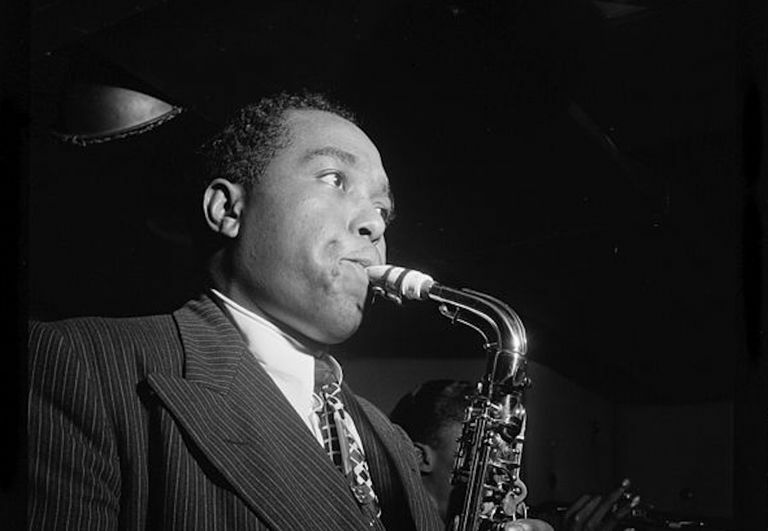 Considered the joint founder of bebop, along with Dizzy Gillespie, alto saxophonist Charlie Parker brought a new level of harmonic, melodic, and rhythmic sophistication to jazz. His music was controversial at first, as it drew away from the popular sensibilities of swing. Despite a self-destructive lifestyle, which ended when he was 34, Parker’s bebop is regarded as one of the most important steps in jazz history, just as important today as it was decades ago. Trumpeter Dizzy Gillespie was Charlie Parker’s friend and collaborator, and after playing together in the swing jazz ensembles led by Earl Hines and Billy Eckstine. Gillespie pushed the limits of the jazz trumpet, demonstrating prolific technique that often screamed into the instrument’s highest registers. After the early days of bebop, he went on to become a living jazz icon, helping to introduce Latin music to the jazz repertoire, and also leading a big band on diplomatic tours around the world. Read my artist profile of Dizzy Gillespie. Drummer Max Roach played with some of the greatest musicians of his time, including Charlie Parker, Dizzy Gillespie, Thelonious Monk, and Miles Davis. He is credited, along with Kenny Clarke, for having developed the bebop style of drumming. By keeping time on the cymbals, he reserved the other parts of the drum set for accents and colors. This innovation gave the drummer more flexibility and independence, allowing him to become more of a presence in the collaborative bebop ensemble. It also made the lightning-fast bebop tempos possible. Drummer Roy Haynes was a member of Charlie Parker’s quintet from 1949-1952. After establishing himself as one of the top bebop drummers, he went on to perform with Stan Getz, Sara Vaughan, John Coltrane, and Chick Corea. Drummer Kenny Clarke played a pivotal role in the transition from swing to bebop. Early in his career, he played with swing bands, including one led by trumpeter Roy Eldridge. However, as the house drummer at the famous Minton’s Playhouse in Harlem, he began to shift the means of keeping time from the snare drum and hi-hat to the ride cymbal. This allowed independence of each of the parts of the drum set, adding to the explosive sounds of bebop. Known for his hard-driving swing and rich tone, bassist Ray Brown began playing with Dizzy Gillespie when he was 20 years old. During his five years with the great trumpeter, Brown became one of the founding members of what would become known as the Modern Jazz Quartet. However, he left to play bass in Oscar Peterson’s piano trio for over 15 years. He went on to lead his own trios​ and became known as one of the masters of the bass, setting the standard for time-feel and sound. Pianist Hank Jones was part of a musical family. His brothers were Thad and Elvin, both legends of jazz. Originally interested in swing and stride piano, in the 1940s he moved to New York, where he mastered the bebop style. He performed with dozens of musicians, including Coleman Hawkins and Ella Fitzgerald, and Frank Sinatra, and recorded with Charlie Parker and Max Roach. As a young man, pianist Bud Powell fell under the tutelage of Thelonious Monk, and the two helped define the role of piano in bebop at Minton’s Playhouse jam sessions. Powell became renowned for his accuracy at fast tempos, and for his intricate melodic lines that rivaled those of Charlie Parker. A member of the famous quintet that recorded Jazz at Massey Hall, a 1953 live album that featured Parker, Max Roach, Dizzy Gillespie, and Charles Mingus, Bud Powell was plagued by mental illness, exacerbated by a 1945 beating by police officers. Despite his illness and early death, he contributed tremendously to bebop, considered one of the most significant jazz pianists. Trombonist J.J. Johnson was one of the leading trombonists in jazz. He began his career in Count Basie’s big band, playing in the swing style that was beginning to fall out of popularity in the mid-1940s. He left the band to play in small bebop ensembles with Max Roach, Sonny Stitt, Bud Powell, and Charlie Parker. The advent of bebop marked a decrease in the use of the trombone because it is not as capable of playing fast and complex lines. However, Johnson overcame the instrument’s obstacles and paved the way for modern jazz trombonists. Largely influenced by Charlie Parker, alto and tenor saxophonist Sonny Stitt built his style on the language of bebop. He was especially adept at alternating between lyricism and fast, accented bebop lines on blues song-forms and ballads. His virtuosic and spirited playing represents the technical and energetic heights of bebop.